ShowSlinger, an online booking and promotions service, has offered a free trial to IHM artists. It connects artists, venues and fans with a simple, powerful app. ShowSlinger can be used for bars, clubs, restaurants, hotels, casinos, resorts, private events or anywhere. Artists can make money in 3 ways: gigs, digital tips and FanFunding. Venues can automatically book gigs in 7 seconds and automatically promote them on the web and our mobile app. Fans big and small can discover new artists and get exclusive access to shows, request songs and tip artists at gigs, and fund their favorite artists and enjoy crazy rewards. IHM artists email us to receive 45 days of ShowSlinger’s platinum membership for free. Not an IHM artist yet? Join now for free. Shakila hit the charts this week with her new single, Imagine. Making it to the number one spot on the Reggae Digital Song Sales Chart. Chuck Murphy debuted with his new single, How Many Times, this week. Securing the number one spot in the Hot Singles Sales Chart. Art Tawanghar released his single, Distorted Time, making it up to the second spot on the Hot Singles Sales Chart. 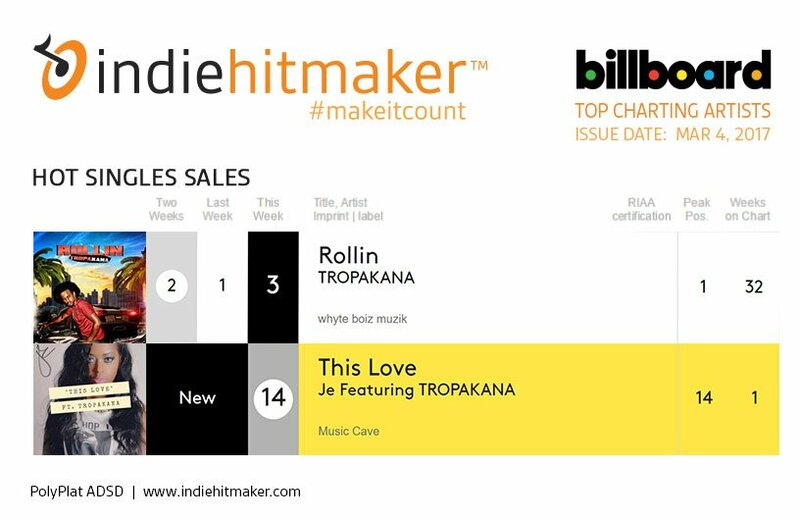 Tropakana hits the number three spot on the Hot Singles Sales chart. He also charted with his new single with Je called, This Love, Making it to 14th place. His sales were reported using IHM’s dropkick. Bobby Washington’s song titled, Boo R U Ever Satisfied, hit the charts once again. Making it into 2nd place on the Hot Singles Sales Chart for the 5th week reporting direct-to-fan sales. There are so many ways to start building momentum by working with Indiehitmaker. From release planning, to finding your fans or building your audience. Get started today for as little as $10/mo and we will help you #makeitcount. Join now.